The first problem for beginner doing business with the need to use a barcode on a product is that it does not know when the barcode number has been approved. GS1 Thailand will issue barcode numbers only, create barcode does not include. Many entrepreneurs always face with the barcode creation problem, so, GS1 Thailand has created new service, “Barcode sticker printing service” to meet customers requirement. 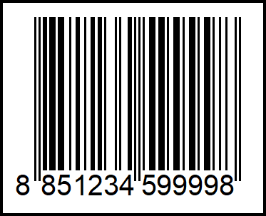 Customers can order GS1 standard barcode in small quantities. And also reduce the process of launching the goods to the market. When the number approval is complete, customer can print the sticker right away. Semi-gloss sticker Semi Glossy and Matt, can be torn, Non-Waterproof, cheaper than other paper in the same size. Used for general merchandise. Yupo Sticker Synthetic paper made of smooth plastic, durable, waterproof and tear resistant. Used for products that need to be chilled or frozen. – 5 x 2.5 cm. – 4.2 x 3 cm. Printing time : 2-3 business days. Minimum order 100 pieces. *The conditions are set by GS Thailand.